No need to travel 600 miles for an authentic Mardi Gras meal – just don your beads and head to 920 Gervais Street for the specialty Mardi Gras at Motor Supply dinner and cocktail menu, available Tuesday, Feb. 9 and Wednesday, Feb. 10, 2016. Executive Chef Wes Fulmer and Head Barman Josh Streetman are bringing Nola to Cola for Mardi Gras 2016, crafting superb menus to feature New Orleans’ most beloved dishes and drinks. 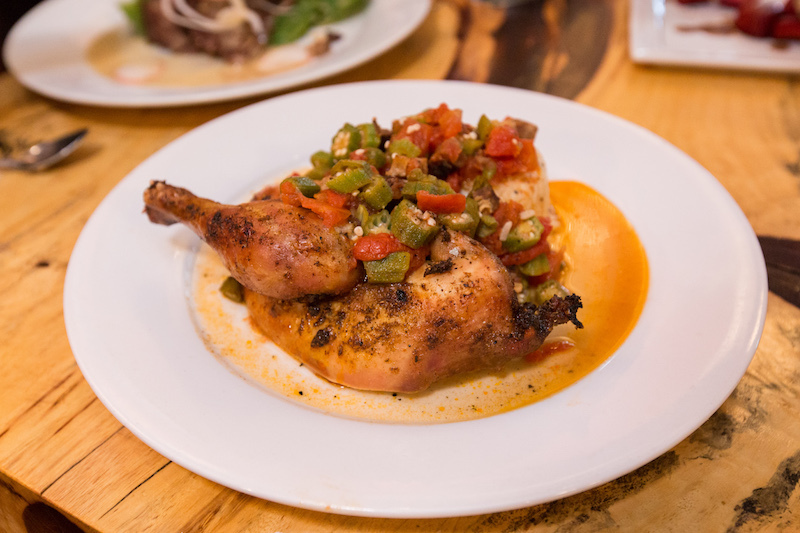 Although Chef Wes is a proud South Carolina native, after two years living and learning in New Orleans, classic Cajun food holds a special place in Chef Wes’ heart… and his stomach. 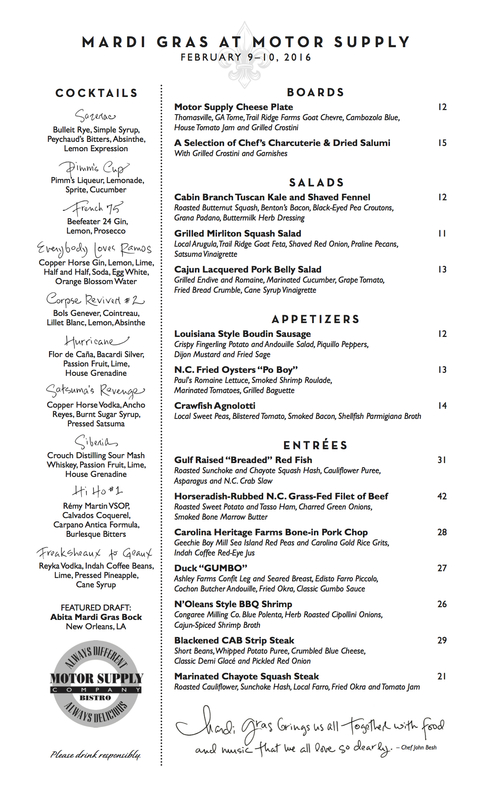 The former New Orleanite’s regard for Cajun food and Nola’s rich history shines through each dish created for this year’s Mardi Gras menu: fried oysters “Po Boy,” gulf-raised “breaded” red fish, grilled Mirliton squash salad, N’Oleans-style BBQ shrimp and boudin sausage, just to name a few. In his take on classic Cajun gumbo, Chef Wes pays homage to several traditional elements of the dish – while incorporating his own twists to the classic recipe. His version includes duck confit leg and breast over farro piccolo, andouille, fried okra and classic gumbo sauce. Originally a metaphor for the diverse cultures peacefully coexisting in New Orleans, gumbo has transcended time to become one of New Orleans’ most well-known specialty food items, especially during Mardi Gras. Head Barman Josh Streetman pays tribute to famous New Orleans bars and recipes in his cocktail menu, featuring libations as timeless as Sazerac, with signature twists from mezcal and egg whites to absinthe and passionfruit. Motor Supply Co. Bistro’s Mardi Gras menu will be available for dinner on Fat Tuesday, Feb. 9, 2016 and Ash Wednesday, Feb. 10, 2016, 5:30-9:30 p.m.
Make reservations online or by calling 803-256-6687.